This last weekend was a memorable one for me. I did my first track event at Road Atlanta. In addition to the fact that Road Atlanta is an iconic track, it held special significance for me. When I attended college at Georgia Tech back in the early 70’s, I was just starting to get bit by the sports car bug. One of the first things I did in my freshman year was to attend a race at Road Atlanta. I can’t remember anymore what cars were running. I do remember that I hitchhiked there (yes, it was safe and acceptable to hitchhike back then!) and snuck in through the woods so I didn’t have to waste precious beer money on admission tickets. After attending a few events in this manner, I was fortunate enough to finagle my way into being a SCCA corner worker. That got me free admission and access to the pits. I worked Turn 3, if I recall. Those were the glory days of Can-Am and Formula 5000. It only lasted 4 years for me but what memories! So anyway, last weekend I returned to Road Atlanta for the first time in almost 40 years. I already knew that it has changed a lot. But the track is still basically the same, except for the dogleg on the back straight. 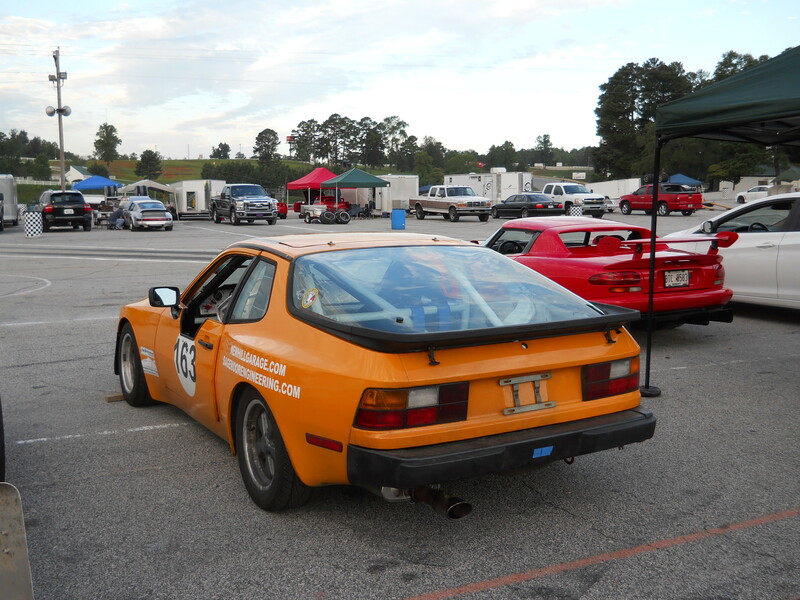 The Porsche 944 track car behaved itself all weekend, with only 1 minor mechanical issue when the circlip came off the linkage attaching the shifter to the shift linkage. This caused me to come to a rest on the side of the course and subsequently be hauled in behind the tow vehicle. The fix was quick when I bummed a replacement circlip from one of the other 944 guys there. This was a Chin Motorsports event. My first with them. First impressions were very good. The event was efficiently run and there was plenty of track time. The only really downer for the weekend was when a guy in a Lotus ran out of skill and backed it into the wall on the pit straight. The track was shut down for over an hour because of this mishap. I’ve already signed up for another Chin event at Road Atlanta next month. It’s great fun!